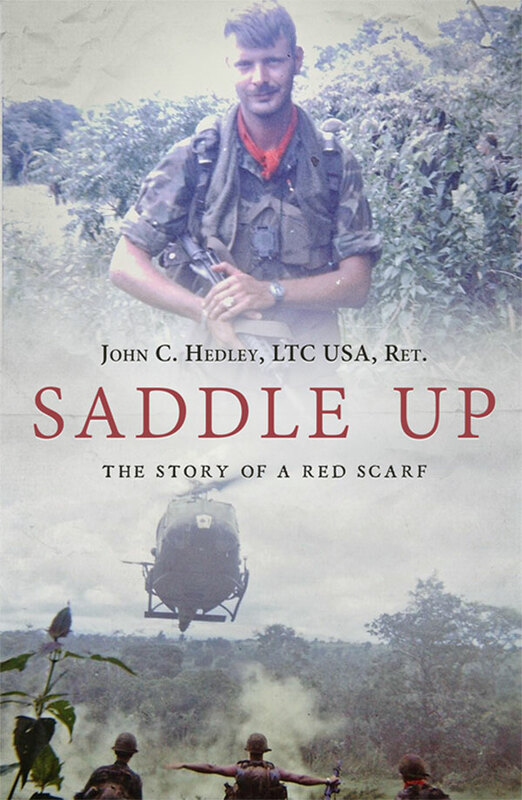 Loyalty to the men who fought alongside him in Vietnam’s Central Highlands during 1969-70 forms the core of John C. Hedley’s memoir, Saddle Up: The Story of a Red Scarf (A15 Publishing, 286 pp. ; $24.99, paper). Operating out of Fire Support Base St. George near Pleiku, Hedley led Fox Force Reconnaissance Platoon of E Company, 1st Battalion, 14th Infantry (the Golden Dragons) of the 4th Infantry Division. The platoon spent most of its time in the jungle and “made contact with the NVA or Viet Cong almost every time they left the firebase,” Hedley says. Commissioned after graduation from West Point in 1968, Hedley found that running patrols and ambushes quickly taught him new decision-making skills. He challenged authority and did not hesitate to put his men’s welfare ahead of his career aspirations. And he led from the front when possible. Every meeting with the enemy taught him a lesson in survival. He shows the depth of his concern for his men by recalling the challenges of three major encounters: a night-long battle in which sappers overran St. George; the pursuit of an NVA battalion; and the discovery of a massive NVA bunker. Hedley did a lot of soul searching in Vietnam. He recognized his inadequacies when, two hours after receiving command of his platoon, he and his men were sent to protect a village ravaged by the NVA. A sink-or-swim situation, the assignment marked the first time that he fully understood his awesome responsibility for men’s lives in combat. Hedley was pragmatic. His willingness to pry into his own psyche gives the book a leadership manual quality. He emphasizes the skills required for success in leading small units. In portraying the psychological and physical impact of the stress of battle before, during, and after contact, he emphasizes fear and how it can hinder a leader and his men. His accounts of atrocities and other brutalities of war leave nothing to the imagination. What Hedley saw when Fox Force rushed to a village after it was hit by the NVA—and the efforts of his unit while defending St. George—borders on the unbelievable. Parts of the book show the futility of America’s war effort under Vietnamization. The NVA and VC moved easily around the countryside, Hedley says, and they had support from all villagers in the area. Plus, “the night belonged to Charlie” because of his familiarity with the terrain. The frequency with which Hedley’s men found enemy living areas, campsites, and even a hospital hidden behind a waterfall made me again rethink the grunts’ world of search-and-destroy. Why were they made to continue? The North already occupied the South. Nevertheless, Hedley’s platoon continued to count bodies, sometimes based on only bloody drag marks. Relegated to a boring headquarters job toward the end of his tour, Hedley found relief by voluntarily rejoining his former battalion for the 1970 incursion into Cambodia. But that’s another story—or book, perhaps. The “red scarf” in the title was worn “even in the field when on combat operations,” by men who proved their merit under fire in Fox Force, Hedley says. A few years earlier, a South Vietnamese commander, whose platoon wore the scarf, presented one to Fox Force for bravery during a combined op. Starting in 2000, the symbolism of the bright red scarf motivated Fox Force veterans to reunite. What began as a yearly reunion evolved into frequent meetings. As a result, red scarf warriors have bonded tighter than ever before. The book contains twenty-eight pages of then-and-now color photographs of soldiers and scenes from the war. Hedley closes with vignettes about events outside of Fox Force and “A Day in the Life…”, a chapter that summarizes how men lived in the field. 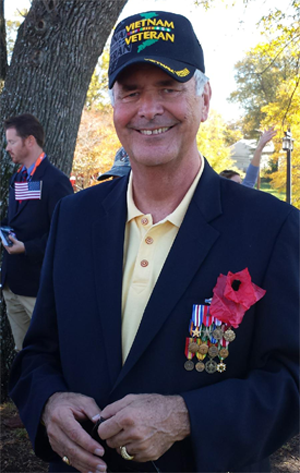 After twenty-four years of military service, John Hedley retired as a lieutenant colonel and then had a seventeen-year career with Raytheon Corporation. This entry was posted in Memoir, Nonfiction, Paperback, Vietnam veterans, Vietnam War, Vietnam War family memoir and tagged John Hedley, John Hedley memoir, John Hedley Vietnam War, Saddle Up, Saddle Up John Hedley, Saddle up The Story of a Red Scarf, Saddle Up Vietnam War by vvaposted. Bookmark the permalink.